And by granting Lewis a plea bargain, Howard, who at the beginning of the trial told the court Lewis was a liar, placed himself in the position of having to prove to the jury that Lewis was credible in testifying against Oakley and Sweeting. Virtually everyone who testified or talked about the case described varying versions of who started the fight, what exactly happened during the melee, and what occurred in its aftermath. It didn’t help that the incident occurred shortly before 4 a.m., when many witnesses and those involved in the incident were at least partly intoxicated. No one testified that Lewis ever possessed a knife, and Lewis never testified that he saw a knife in the hands of Oakley or Sweeting during the incident. I asked Ray, “Is everything alright?” and he tapped me on the shoulder and was like, “Come on, let’s go” and brings me back to the limousine. Gwen and his friend came up behind me, talking tough and I turned around and was like, “Is there a problem?” and then they started talking about what they were going to do. I said, “You’re not going to do nothing to me, and we got into a confrontation and Ray came back and grabbed me and put me in the limo and he got back out of the limo because his friends, (Joseph) Sweeting and (Kwame) King were out of the limo talking to the guys, asking what’s going on or whatever. Then one of the guys walked by and said something to Ray and then I saw some more guys coming up behind Ray, so I got out of the limousine to tell Ray, and that’s when Baker hit me in the head with the Moet bottle. And that’s when everybody started fighting. LEWIS: It was, from that point, it was chaos, whatever, when he hit him in the head, them two just, I mean, went in a dramatic fashion of fighting. LEWIS: Fighting, I mean, you hit me, I hit you back. We just fighting. We just fighting. Lewis may just happen to be a flawed person who made major mistakes in his past but has learned from them and moved on to live a better life. That won’t be any consolation to the friends and families of the victims, though. To read the entire article on Examiner.com, including different accounts of the argument that led to the fight, the brawl, and the aftermath, click here. 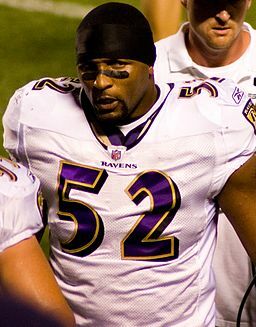 See http://www.examiner.com/article/ray-lewis-former-co-defendant-speaks-on-argument-that-led-to-2-murders-2000. This entry was posted on February 2, 2013 at 11:36 am and is filed under Examiner.com, NFL. You can follow any responses to this entry through the RSS 2.0 feed. Responses are currently closed, but you can trackback from your own site.